The World’s most efficient and effective way to straighten teeth! The Individual Patient (IP) Appliance® was the first customized appliance system in the world and is an enhanced straight archwire technique. In the current standard in orthodontics, dentists use “straight archwire” appliances with one bracket design and one archwire for all patients, which is not always sufficient to treat all tooth movements. However, the IP Appliance® revolutionized orthodontics by allowing doctors to customize the optimal appliance for each patient. This customization results in faster, more consistent treatment results. Tens of thousands of successful cases from all over the world have already proven that this is the most efficient way to straighten your teeth, the next generation of orthodontics. 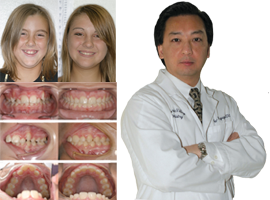 "An appliance diagnosis for each patient leads to a completely new dimension of orthodontic care that far surpasses that of the past."